Clinical Professionals aim to be aware of the latest industry events and news whilst also aspiring to be at the forefront of the latest analytics and reporting. As a result we have collaborated with Vacancysoft to create monthly reports that provide an in-depth analysis of vacancies across various sectors, countries and companies. 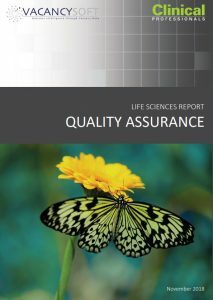 The latest CPIA report features analysis and data from the Quality Assurance sector within the pharmaceutical industry for UK, Ireland, Germany, Switzerland, Belgium, Netherlands, and Luxembourg. It is an almost impossible and thankless task to even begin to understand the many potential outcomes of Brexit, are we a small mosquito that can make an immense impact? At this time in November 2018 we are still navigating potential outcomes at what seems a very late stage in negotiations. Whilst the UK has had a less hopeful performance in live job roles in Quality Assurance over the last two years, from July to September (2018) we see a significant upward spike in new roles opening. Whilst QA job opportunities in the EU27 have seen a growth circa 6% (2016/2018 data). The UK however shows a far more volatile picture during this period with overall vacancies tracking slightly below the EU27 average. Vacancies were highly concentrated within Quality Control (QC) with the volume of live roles increasing by 30% on 2017. Other live open positions across the EU that have risen include Compliance (+33%) and Audit (+36%). With the EU Clinical Trials regulation soon taking effect the higher standards expected in safety could be the main driver for increased roles in QA/QC. However, having an understanding of the growing opportunity in manufacturing will also impact the fortunes of the UK post Brexit. So considering a future landscape of potential hope, we see the UK’s biotech sector primed to close the gap on San Francisco and Boston, the world’s two leading centres for life sciences, after receiving more venture capital funding than any other country in Europe last year, we see pockets of investment in specialist manufacturing within biotech. However at least 50% of new drugs will continue to be small molecules, at least for the foreseeable future, and there must be further investment here. As the industry continues to adjust and change we see a different inititiatives emerging such as a drive to reduce waste in manufacturing. This neatly aligns with the idea of making to order, as in personalised medicines and additionally avoiding failed batches. Making medicinal products is becoming less craft dependent and companies are adopting principles of design for manufacture similar to those from the automotive industry: production more like the six-sigma approach. The industry needs less economy of scale (big batches from big facilities) and more economy of scope (access at reasonable cost to adaptable plants at smaller scale and expertise to meet the demands of the emerging manufacturing landscape). So it’s good to know that over the last three years or so a consortium of pharma companies made the case for UK investment in extra and advanced facilities to meet these trends. The result is the Medicines Manufacturing Innovation Centre (MMIC). The MMIC will deliver a step-change in the capability and capacity of the UK in the manufacture of small-molecule medicines. GSK and AstraZeneca have each shown their commitment to the venture through direct funding (£7m each). These investments and initiatives will of course impact the opportunity for new roles opening up in Quality Assurance. The UK is one of the largest pharmaceutical markets in the world, and the sector makes a greater contribution to the UK economy than any other industrial sector. Pharmaceuticals account for 9% of UK manufacturing output and almost 5% of total exports. Investment activity has been slowly increasing over the last couple of years with confidence beginning to return to the market and this looks set to continue into 2010-19, despite the ongoing threat of global economic uncertainty and the threats associated with exit from the EU. Enhancing the link between those doing research and development and those manufacturing drugs will reduce the risk in the process of adopting disruptive technologies and accelerate the translation of the UK’s strong research base into new industrial approaches of the future in a new post-Brexit era. And to conclude, perhaps my favourite manufacturing investment of 2017 was Oxitec Ltd. first centralised Friendly™ Aedes egg production unit, with the capacity to generate one billion mosquito eggs per week, in Oxfordshire, UK. Oxitec’s solution will revolutionize how societies confront public health challenges posed by invasive mosquitoes that transmit devastating diseases. Over 725,000 people are killed by a mosquito bite each year. Dengue fever infects approximately 400 million people annually, causing an enormous health and economic burden in affected countries. These viruses have devastating consequences including microcephaly, Guillain-Barré syndrome, encephalitis and a variety of other serious health disorders. In the U.S. alone nearly 1,300 pregnant women from 44 states had lab evidence of possible Zika virus infection in 2016, including 77 reported pregnancy losses and 51 babies born with birth defects such as microcephaly and brain abnormalities, according to the Centres for Disease Control and Prevention (CDC). Oxitec’s technology represents a paradigm change in combating dangerous Aedes aegypti that threaten more than half of the world’s population, and this factory will better position us to help countries in need of superior solutions in the fight against this invasive mosquito that carries Zika, dengue and other harmful viruses. Its great to see UK manufacturing facilities have such a global impact on such a dreadful disease. Lets hope the UK in a post Brexit landscape continues to create such immense opportunities for so many people. To view the full report and previous editions, please visit the CPIA report on the Clinical Professionals website here.